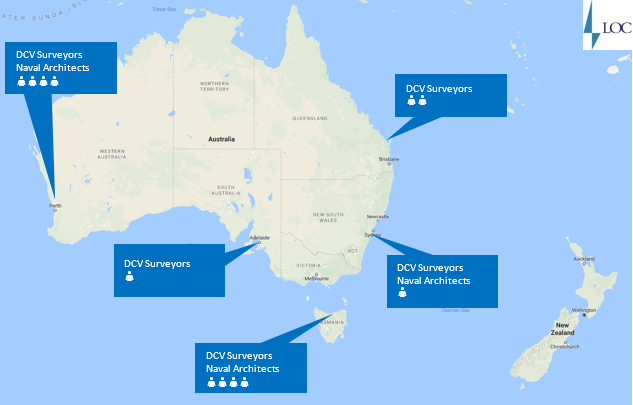 Our AMSA accredited Marine Surveyors provide the complete range of DCV surveys across Australia. LOC offer a comprehensive service in maritime with local officers in key locations around Australia. LOC offer a comprehensive service in maritime. With local officers in key locations around Australia, our master mariners, surveyors, naval architects and engineers can provide a prompt response to requirements for any maritime functions you need help with or independent advice. Our Marine experts have worked in Australia and around the world and we would be happy to provide examples of their work. If you would like more information on LOC’s capability or experience, please contact David Wise-Mann on the numbers listed or click on the link to the local surveyor in your State. To enable us to provide a written quote please kindly contact dcv@loc-group.com and provide the attached details.